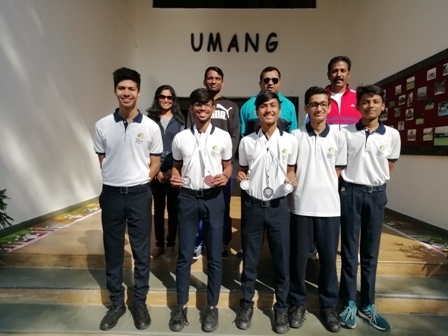 The motivation that propelled Tanay Agarwal, Shaswat Pandey, Taksheel Singh Rawat, Adarsh Gupta and Satyam Soni-our students at the IBSO National Athletics Competition 2018 was simple- to bring glory to the school. This competition was hosted by MIT, Vishwashanti Gurukul, Pune on 25th November 2018. TSVS sent its contingent for the Under-19 boys category. The athletes from our school had an impressive 5 medal haul at the competition where they won 4 silver medals and 1 bronze medal. Satyam Soni stood second in the 800 m category, 1500 m category, and Long Jump category. Adarsh Gupta stood second in the 400 m category and third in the 800 m category. We congratulate our students for such praiseworthy performance and wish all the best for the games ahead.